Nothing is as romantic as a picnic and with these romantic picnic for two recipes, all you need is the perfect picnic place and a little time alone. Although going to the hot new five-star restaurant can be romantic and intimate, a picnic for two is sure to be just as romantic while giving your checkbook a break. Valentine's Day is the perfect day to have a romantic picnic, but in some places February weather might be seen as a deterrent to a picnicking. But, when it is cold outside, a picnic inside can be the perfect remedy to chase away the winter blues. Just spread a blanket out on the floor, light some candles, and fill your picnic basket with some of these romantic picnic recipes for two and you are on your way to a night neither of you will forget. Chicken is the perfect picnic food. It can be eaten with your fingers and tastes just as good cold as it does hot, some people say it tastes better served cold. Any basic fried chicken recipe will work for a picnic, but for a special picnic you might want to cook up some spice rubbed chicken. This chicken recipe is baked, so it is as easy to make as it is to eat. If you are watching calories, you can use skinless chicken parts or even skinless and boneless chicken breasts. If you want to keep the skin on the chicken parts, be sure to rub the spice mix under the skin as well as on the skin for a full flavor experience. Rinse the chicken parts and then dry them. Mix together the salt, brown sugar, chili powder, paprika, pepper, and cayenne. Rub the spice mix under the skin as well as over the skin of the chicken. Using toothpicks, secure the skin back in place so that it does not shrink away from the chicken pieces as the chicken cooks. Place the chicken pieces on a cookie sheet and cover it loosely with foil. Place the sheet on an oven rack. Let the chicken rest in the refrigerator for at least an hour, but 6 hours or overnight would be best. The longer the chicken rests, the more of the spice rub that will be absorbed by the chicken and the deeper the flavor will be. Roast chicken for 12 minutes. Raise the oven temperature to 500 degrees and roast for 8-10 minutes more or until breast pieces reach 160 degrees. Remove the breasts from the oven and let the dark meat pieces cook for five more minutes or until they reach 170 degrees. Remove the remaining pieces from the oven and let the chicken cool to room temperature. A good white wine will compliment the flavor. Green goddess dressing makes any salad a special treat. You will need anchovies to make this dressing but, never fear, they blend into the dressing and add a subtle saltiness to it, not fishiness. You also need tarragon vinegar, but if you can't find it you can just use white wine vinegar and add 1 tablespoon of chopped tarragon to the dressing. You can use a blender or a food processor to make this dressing. I have had the best results with a food processor. You can use this dressing with any salad mix that you like, but I like it with a spring mix or a garden salad. Romantic picnic recipes for two don't stop at the salad. Dessert is just as important and many would say the most important part of the picnic. Just as keeping the main course simple and easy-to-eat with your fingers, a simple easy-to-make and easy-to-eat dessert is also the way to go. I would suggest chocolate covered strawberries. Select the largest and ripest strawberries you can find and, if at all possible, use strawberries that still have the stems attached. The stems will make dipping the strawberries easier. 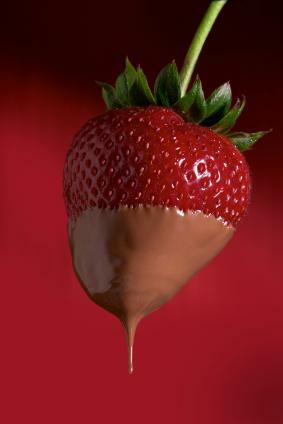 As far as the chocolate goes, I have found that dark chocolate compliments the sweet/tartness of strawberries well. But if you have a particular kind of chocolate that you like, by all means go with that chocolate. Place the strawberries on a plate or cookie sheet that has been lined with paper towels. Line a second cookie sheet with parchment or wax paper. If you are using a block or bar of chocolate, chop it into smaller pieces using a serrated knife. Serrated knives are the most effective way to cut a bar of chocolate into small meltable pieces. Place the chocolate pieces into a heatproof bowl. Place the bowl over a saucepan with 1 inch of water in it. Make sure that the water does not touch the bottom of the bowl. Melt the chocolate over the simmering water, stirring occasionally. Remove the strawberries from the refrigerator, making sure that they are dry. Dip each strawberry into the melted chocolate and place them on the cookie sheet lined with parchment paper. Place the cookie sheet of chocolate covered strawberries into your refrigerator and let chill for at least one hour. For a more dramatic look you can melt some white chocolate and drizzle it over the chocolate covered strawberries. Do not place the strawberries in the freezer; they will become mushy when they thaw.